Would You Fall for Maxima Aquafun? Never judge a place based on what you hear or read - that’s what I learned from visiting Maxima Aquafun. I’ve heard about this resort countless times, but my sissy self never bothered to check it out. I thought it was only for the adrenaline junkies - those who are fearless enough to jump from a high dive board or take the giant slide to the deep blue sea. My interest started to bud upon seeing how it was constructed to accommodate adventure seekers without sacrificing nature's beauty. Situated on a rocky cliff in Penapalata, Samal Island, the resort has kept green trees for shade, cool, and calm. They simply added stairs and pathways to the rooms and huts for the convenience and safety of visitors. Perhaps from a bird's eye view, Maxima Aquafun is green and blue with gray lines and colored dots from people's swim wear. Trampoline giant slide - you start from the top and splash into the sea. The absence of a long stretch of white sand may put a frown on a beach bummer's face, but the resort's rock formation will definitely charm snorkelers and divers. Is has a flat rock that extends about five meters from the island to the sea. However beyond this area, the depth abruptly goes down to 90 to 120 feet (depending on the tide level), the reason why all guests - regardless of their swimming skills - need to put on a life vest the entire time they're having a good time. 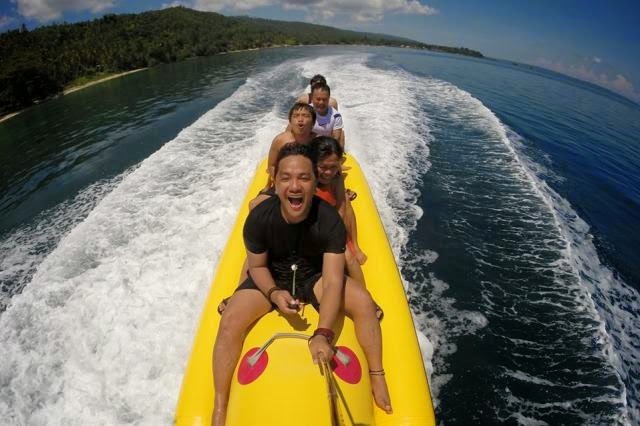 Epic banana boat ride. Yeah, I look so cool! Photo by Olan. 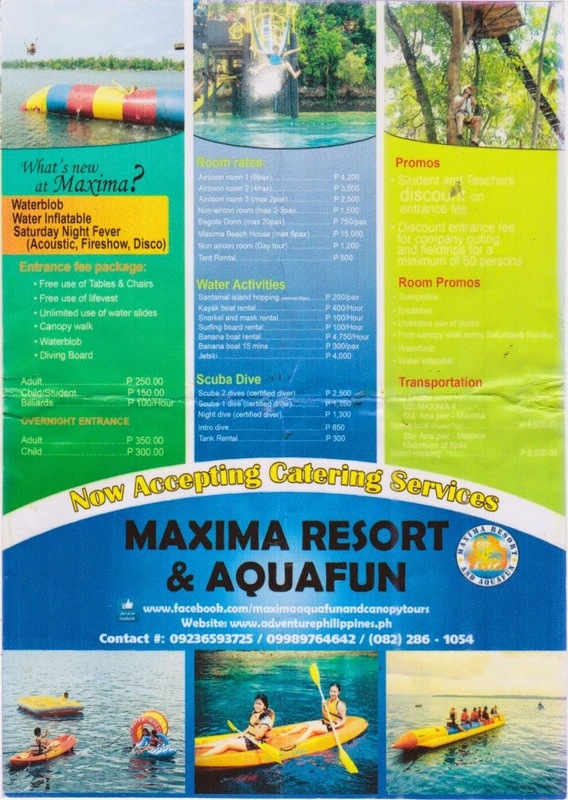 Allan Cayacay, the Operations Manager of the resort, explained that Maxima Aquafun used to be a pearl farm. Unfortunately the southwest monsoon washed the oysters and pearls away, putting an end to the business. The area was converted into a resort and named it after the pearl oyster, Pinctada Maxima. Since then, it has attracted visitors for its water activities such as trampoline slides, water blobs, snorkeling, kayaking, surfing, and banana boat and jetski rides. Diving is also a must for those who want to explore the cliff wall of corals naturally created by the rock I mentioned in the previous paragraph. And to keep you even more fascinated, underneath there are caves only divers can explore. At the edge of the rock, where the 120-feet depth starts. While our friends were jumping, sliding, and screaming, Dan and I contented ourselves with snorkeling. Most of what we saw were hard corals, but we spotted some soft corals tucked in between. The anemone below particularly caught our attention because of the dark clown fish lurking in it. We also saw other types of sea creatures: moorish idols, parrot fish, cornet fish, sergeant majors, striped surgeonfish, anchovies, etc. There were wild and cultured giant clams, too! Clown fish hiding in its home. Giant clam with an open mouth. Tip: The best area for snorkeling is on the farthest right (facing the sea) because the visitors rarely swim there. They often crowd near the diving boards and slides. Left to right: Fra, Jayvie, Jon, Sarah, Olan, Sir Alan | Dan, Nicole, Kit and Erwin. Sir Allan, a licensed dive instructor, said that if we try their 20-feet intro dive, we can take a closer look at Ariel's friends. He also mentioned that on rare occasions, whale sharks get lost in the resort, and dolphins can be seen in the sea. It was good to know that as it proves how rich marine life in Samal is. Click the flyer for a bigger resolution of the image. All prices are subject to change without prior notice. Special shoutout to The Travel Teller for organizing this fantastic getaway.